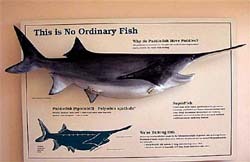 The Paddlefish is Montana's largest fish. They're sometimes called living fossils, because they've remained the same for 300 million years. Scientists call them a primitive fish, and they look exactly like something from the dinosaur age. Everybody thought paddlefish were gone from Montana's rivers, extinct like the dinosaurs until someone accidentally snagged one in 1962. Fish experts got to work right away placing paddlefish in new homes so they would disperse and help the species regenerate. 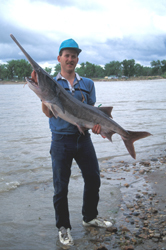 Paddlefish were planted in Montana's Yellowstone River in 1963. Scientists have put tiny radios in some paddlefish to see where they go when they're released. They seem to go everywhere they can, sometimes hundreds of miles from where they're released. Glendive, Montana is the best place to go for fishing for them. The Intake Diversion Dam 17 miles north of Glendive is crowded with fishing fans from the middle of May through June every year. Most paddlefish are about 5 feet long, but some grow to 6 feet and can weigh more than 100 pounds. The biggest paddlefish caught in Montana was 142 pounds. They can live to be 30 years old. Their bodies are similar to a shark's, except a paddlefish has a long, paddle-like nose. They have no scales except for a small patch on their upper tails. Their skin is smooth, shark-like, and tough. The mouths of paddlefish are very large and their gills are covered with an armor plate. They won't eat anything but zooplankton (tiny animals that live in salt water and freshwater) and insect larvae. They couldn't eat anything larger such as other even if they wanted to because they don't have any teeth! Paddlefish are like whales because they use a filter, or net, in their mouths to pull water through. The net collects the plankton and the water passes through. They use their paddle noses to "sniff" for the plankton and larvae. Because they won't eat worms, bait, or lures, paddlefish have to be caught with a large three-part hook. Those fishing for paddlefish use the "snagging" method. They're a favorite fish for some people to catch because they fight hard to get away, and often do. It's a adventure to catch the large fish. They're so big they can break a regular fishing rod and even pull someone holding one into the water. Although large rods and hooks are used, paddlefish are still difficult to catch because of their tough skin, armor, and fighting attitude. Paddlefish may look strange, but to many, they taste great. Some people even like to eat paddlefish eggs (caviar) and pay about 7 dollars for a mouthful of them! Paddlefish, and sturgeon (a fish similar to the paddlefish, but its eggs are more valuable), are sometimes raised by fish farmers just for their eggs. Eaten on a piece of toast or a cracker caviar is thought of as a delicacy. Caviar looks like tiny black eyeballs and it tastes like salty rice. Once, the only way to get the eggs was to kill the fish. These days caviar companies perform an operation on the fish to remove the eggs and then let them go, as sturgeons and paddlefish are hard to find in most places.